O. O. provides food assistance to families at Christmas and educates others about these families in our community without enough in order to encourage a preferential option for the poor. 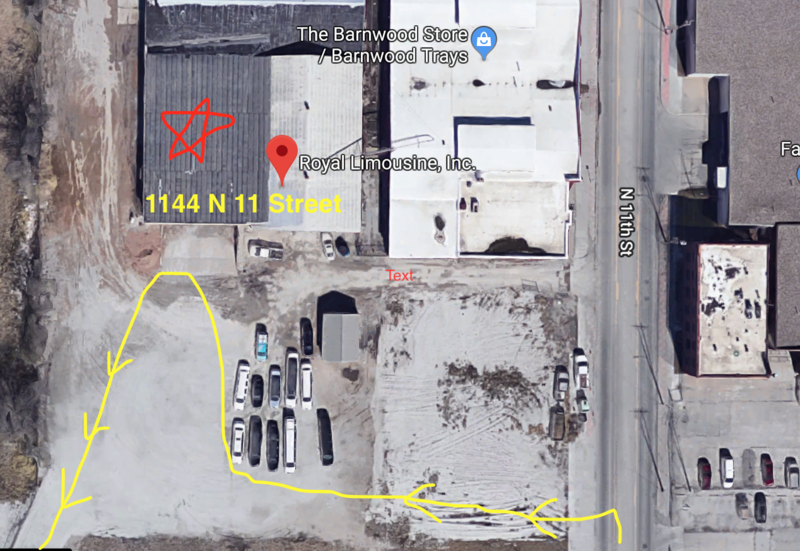 Note: The red arrow indicates the 2018 OO Warehouse. The yellow arrow indicates the delivery line path. Enter the line from 11 Street. Click here to visit the Operation Others store in order to purchase or renew magazine subscriptions. The annual magazine and gift drive begins October 1st (but you may purchase/renew year round). Please visit our online store and participate. You will be asked to enter in the Prep student's name (or skip this step if you do not want to designate the sale for a student) and then you will be able to shop for magazines and gifts. Digital subscriptions are also available. 40 percent of sales go directly to support O. O. 's work learning about food insecurity in the U.S. and toward providing Christmas food boxes to local families. Thanks for your support. Tuesday, September 25 Large Group Meeting for all students at Omaha-area Catholic Secondary Schools interested in leaning about the problems families face getting enough food and helping with this year's Operation Others. This meeting will be held in Prep's Campus Center from 6-7:15pm. October 1-31: O. O. Magazine Sale/Renewal. Click here to purchase/renew magazine and to buy gifts. Tuesday, October 30: Trick or Treat for Cans! Meet at Prep at 5:30 p.m. We will collect cans until 7 p.m. At 7 p.m. we will return to Prep to sort cans. We will be finished close to 8:15pm. Saturday, November 3: Call-In Day, 9 a.m-1:30pm. Call-In Number is 531-329-6003. Sunday, November 11: Pancake Breakfast for O. O. @ St. Leo’s at 102nd and Blondo. The cost: adults $7.00, children $3.00, families $22.00. The breakfast includes pancakes,eggs, sausage, potatoes, fruit, coffee and/or orange juice. November 12-16: Food Drive @ Creighton Prep. Bring canned chicken or tuna to the Loyola Room before school and receive a free doughnut! We are trying to collect 4,000 cans! House cup points awarded. Friday, November 16: All food drives must be complete by this date. On this date, O. O. students will bring all collected food to a warehouse on CU's campus (times TBA) for storage until delivery weekend. Please have all food in boxes that are taped shut. Also, count all of the food collected and report totals to O. O. moderators. Saturday, November 17: Turkey Drive (8:30 a.m.-2 p.m.) at Creighton Prep's east parking lot, Skutt's parking lot, and GolfTEC's parking lot (114th and Davenport). Please donate a turkey or two! We are trying to collect 800 turkeys! Tuesday, December 11: O. O. Christmas Party for students from all O. O. schools. We will also write Christmas cards for all receiving food boxes this year. This party will be held in Prep's Campus Center from 6-7:30 p.m. Please bring 2 cans of tuna/chicken or $2 for admission. Friday, December 7: Feast of the Immaculate Conception and O. O. Mass at Prep for the Prep Community and O. O. Core Team members from O. O. Schools (9:45-10:45 a.m.). Non Prep-students should be back at their own schools by 11:15 a.m. at the latest. Wednesday, December 19: Preparation Day, O. O. Club and Core Team members only. Help load the truck at Prep after exams; 11am- until 2 p.m. We may move to the warehouse to unload (Location TBAl) if time allows. Thursday, December 20: Setup day @ the warehouse (1144 N 11 Street) 11:00am-4 p.m..
Friday, December 21: Packing Day @ the warehouse (1144 N 11 Street) from 10:00 a.m.-4 p.m.
Saturday, December 22: Delivery Day @ the warehouse (1144 N 11 Street)--Mass at 8 a.m., delivery from 9 a.m. until finished, usually around noon. Thanks to everyone who volunteered as part of the O.O. Delivery Weekend. Each year, Operation Others purchases most of the food for families from the Food Bank for the Heartland. We make efforts to provide healthy and delicious food. By purchasing through the food bank, a one dollar donation can be used to purchase a retail equivalent of $3 worth of food. Therefore, we can provide food for a family of four for approximately $25. If you would like to make a monetary donation, checks made out to Operation Others can be sent to 7400 Western Ave. Omaha, NE 68114. From time to time, the Food Bank is low on food or does not have the type of food/quantities needed for our project. Therefore, we invite you to consider hosting a food drive for O. O. If you would like to host a food drive, please contact one of the O. O. moderators. Also, take a look at the following links for information about hosting a food drive and the items we would like to have included in our food boxes.